Ticket required for entry - get your free tix now! Due to permitting challenges, Saturday and Sunday is 21+ only until further notice. We sincerely apologize for this new change. Please know that we are doing everything possible to ensure a positive experience for our entire community. 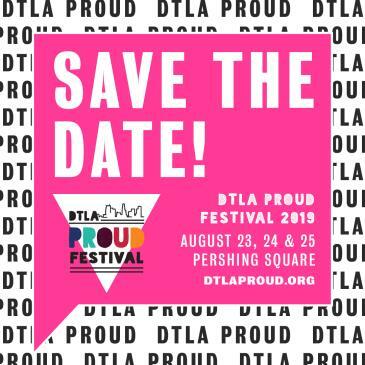 DTLA Proud Festival returns to Pershing Square August 23rd-25th - celebrating the culture, history, and diversity of the growing LGBTQ+ community that lives, works, and plays in the thriving heart of the city of Los Angeles. Featuring a diverse lineup of local stage talent, community booths, art installations, retail vendors, interactive exhibits, food trucks, bars, and a pop-up water park, DTLA Proud Festival is created by the community, for the community. Proceeds from the festival will help build the DTLA PROUD Community Center.